Northern Ireland, like every other part of the world, is facing the challenges of a rapidly changing electricity market. NIEVO is particularly interested in the electrification of transport and heating along with domestic renewables and storage. But before we get into the nitty-gritty, lets take a moment to familiarise ourselves with the players. Most of us still refer to ‘NIE’ when we talk about anything to do with electricity in Northern Ireland, but the European IME 3 Policy for internal markets in electricity and gas forced the NIE of old to split up its operation several years ago. So lets untangle the web of companies that make up Northern Ireland’s power infrastructure currently. The power stations, solar PV and wind farms that produce our electricity are known as Generators. Kilroot and Ballylumford power stations are owned by AES and Coolkeeragh is owned by ESB International (a wholly owned subsidiary of ESB). While not ‘Generators’, we also receive power via the Moyle interconnector between Northern Ireland and Scotland (owned by Mutual Energy) and the East West interconnector (EWIC) between Ireland and Wales (owned by the EirGrid Group). A further new link is planned called the north-south interconnector, (owned by NIE Networks in the North and ESB Networks in the south). This is the 2nd North South link, but as it joins 2 jurisdictions, but not 2 separate grids, strictly speaking it’s not an interconnector. SONI manage the high voltage system (275kV and 110kV) that takes electricity from the Generators and feeds it to the distribution system. SONI are part of the EirGrid Group which is owned by the Irish State. It performs the same function North and South, with the all-island grid being controlled from both Belfast and Dublin on a week about basis. They also provide this live visualisation of Northern Ireland’s system demand, generation and fuel mix. 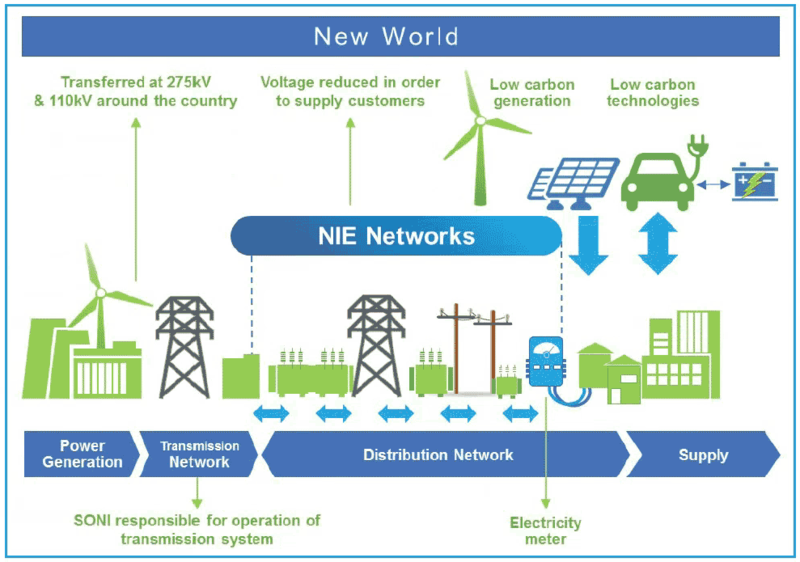 The company that distributes electricity from the TSO to the business and domestic consumers is NIE Networks. It was acquired by ESB in 2010. ESB is 95% owned by the Irish Government. NIE have 880,000 customers in NI, 1,200 staff and look after 47,000km of distribution lines. To complicate things, NIE Networks are also the Transmission Asset Owner as well as being the distribution owner and operator (they own the hardware that SONI use, including 2,200km of transmission lines). There are currently 5 suppliers licensed to sell electricity to domestic customers in Northern Ireland. They are Budget Energy, Click Energy, Electric Ireland, Power NI and SSE Airtricity. These are the companies that you probably have most contact with and the ones that issue you with your electricity bill. The Utility Regulator is an independent non-ministerial government department responsible for regulating Northern Ireland’s electricity (plus gas, water and sewerage). It promotes the short and long-term interests of consumers. So, now that we’ve got that straight, lets look at what’s happening to our network as we move towards a more electric future. On the 14th September we attended the “Greater Access to the Distribution Network in Northern Ireland” workshop in Belfast, run by NIE Networks and aimed at gathering evidence for future decision making. In one of the opening key notes, Tanya Hedley from the utility regulator’s office talked of working towards the the three D’s – Digitalisation, Decentralisation and Decarbonisation. This ‘New World’ diagram from NIE shows solar panels and domestic batteries and if you’ve ever considered running your home (and your EV) on your own self-generated power, then you’ve probably considered both already. The G83 limit is 16A per phase (3.68kW) export with a maximum installed capacity of 4kW per phase – this can be any technology type, PV, storage or a combination. Anything over this limit should be G59. We are in the process of adopting the G59 fast-track process used by some GB DNOs which would allow 4kW of PV + a 4kW battery with a G100 export limitation to 3.68kW – the G100 document is available at http://www.nienetworks.co.uk/documents/useful-resources/21_007v1 but this process is not in place just yet. Lets try to decode that for the layman. First of all a DNO is a Distribution Network Operator, NIE Networks in the case of Northern Ireland (check out some other TLA’s in the glossary at the bottom of this post). NIE Networks is transitioning to a DSO (Distribution System Operator), an organisation which operates a more open, flexible, sustainable and secure network. NIE are part of the ENA Open Networks Project, an association that brings together DNOs from across the UK and Ireland. Back to decoding that email – G50, G83, G100? Those are all Energy Networks Association Engineering recommendations. These are Policy documents that are adopted and adapted by DNOs. To complicate things, G83 will be replaced by G98 and G59 will be replaced by G99 in the coming months. These new documents may perhaps be the solution to many of the issues as they will fast-track the application procedure, reduce costs and allow home owners to connect modern inverters which can limit their export. For example you might install 10kW of solar PV, but the system would be set to only ever export a maximum of 3.68kW back to the grid. As maximising self-consumption is the aim of most micro generators this would be no hardship. “Q1 or Q2 2019” was quoted as the best guess for the arrival of these changes. We have heard anecdotally that ESB, the company that owns NIE Networks remember, currently allows up to 6kW of PV plus 10kW of storage in the South. However when we put forward this information at one of the break-out sessions a representative from ESB said this was not that case. Although he told us that there is a 25 Amp per single phase limit in the South (vs the 16 Amp limit already mentioned for the North). This category includes smaller energy conscious customers (domestic or non domestic) who have invested in off-the shelf low carbon equipment to derive income from renewable energy schemes, to reduce their overall costs or for social responsibility reasons. Generation or demand is unlikely to be actively managed and is installed on a passive fit and forget basis. ‘Off the shelf’ low carbon equipment in this case includes solar panels, heat pumps or electric vehicles. These customers are likely to be exporting and importing and would seek to benefit from supplier’s time of use tariffs. To me, the word ‘prosumer’ has always referred to an electrical product (like a camera) that’s somewhere between professional and consumer grade. 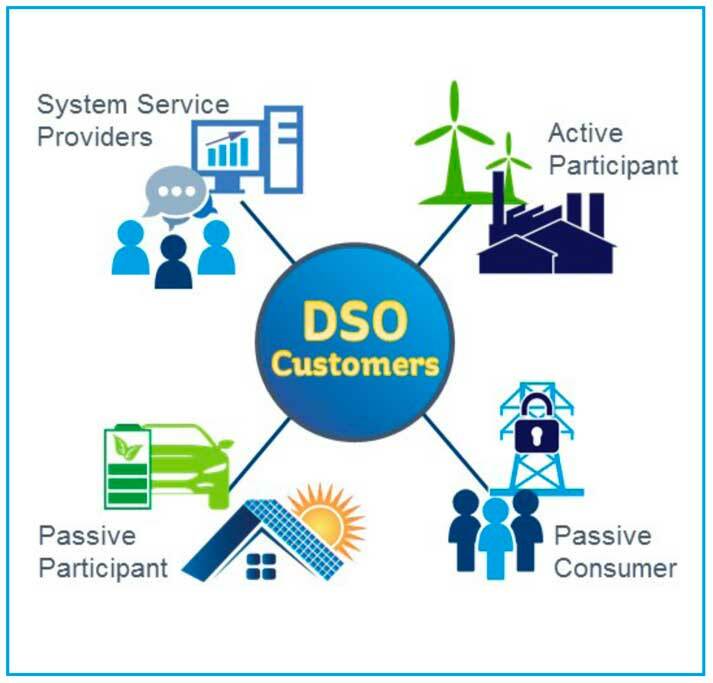 But NIE have repurposed this word to represent their customers who produce as well as consume electricity. It’s not all good news for these prosumers though, as more people chose to generate their own electricity, they are going to have to pay more standing charges in order to stay connected to the grid. Currently 74% of NIE Networks revenue comes from ‘Unit’ pricing while 15% comes from ‘Standing Charges’, but that balance will change. Non-domestic customers are also going to have to pay higher ‘Capacity’ charges too (currently 11% of revenue). If NIE change the balance of their pricing structure too much though they are in danger of disincentivising anyone thinking of installing renewables. People should be encouraged to take up these technologies, and that usually means making it economically attractive. While Northern Ireland’s history with the RHI has badly damaged the publics perception of these incitements, it should not be allowed to eradicate new, properly managed incentives in the future. ‘Time of Use’ tariffs are another option that may be coming in the future, but for these to work customers will have to have new half-hour meters fitted. Will it push people off grid completely? While it’s a nice idea, it’s pretty impractical in this part of the world without the addition of an expensive wind turbine or Diesel generator. Getting through December to February with a Solar PV system is a non-starter in Northern Ireland. However charging a domestic battery with cheaper Economy 7 electricity at night, to use in the day, is a very real prospect. While the economics of this are all still in the balance, the recent electricity price increases (18.2% coming for SSE customers on 1st October for example), and the continuing downward spiral for battery prices, means more people will start considering them. Here’s an interesting quote from the NIE Networks document for the workshop. The diagram above shows that an additional 249MW is due to be added to the network by 2020. 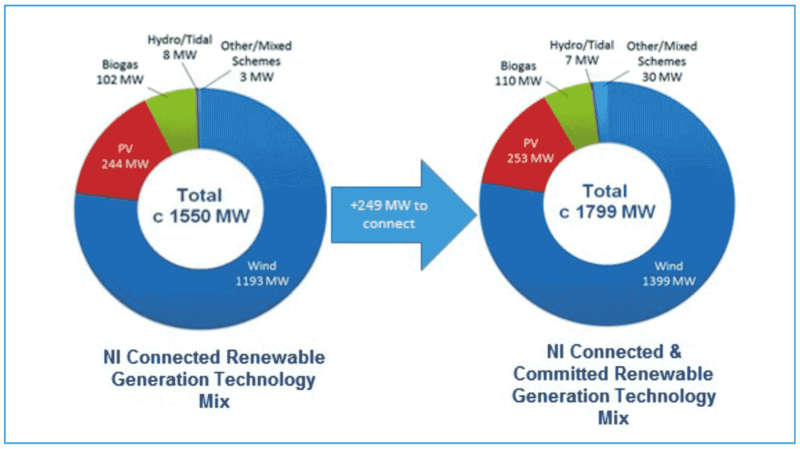 Interestingly that new total figure for renewables of around 1800MW is equal to the maximum demand for the whole of Northern Ireland. 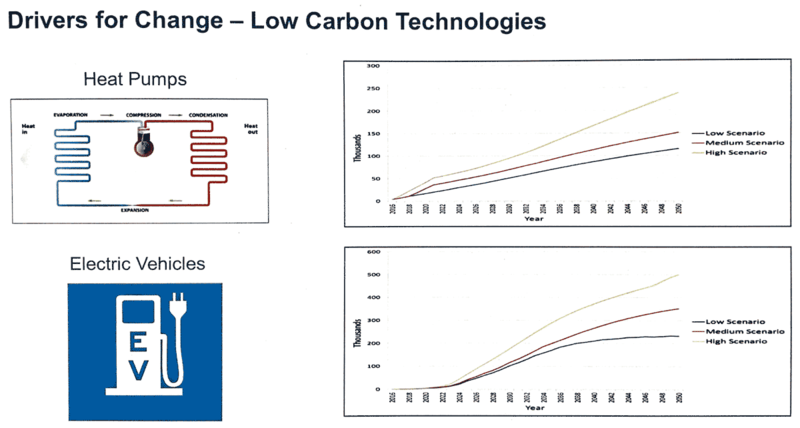 When NIE were working on RP6 (their business plan for 2017 to 2024), their research came up with 3 scenarios for the future, see the example graphs below. NIE chose to base their plans for the future on the most conservative demand prediction of the 3 scenarios (LOW). However at the workshop they revealed that not only are they seeing that we are above that, we are actually above the middle (MEDIUM) scenario too. NIE are looking for opinions from stakeholders on whether they should take their ‘Business as Usual’ approach to this increasing demand, more copper in the ground and bigger transformers for example. Alternatively they could save money by investing in smart grid technology instead. For example, there appears to be a lack of SCADA data at lower levels of the network. This coupled with NIE’s “conservative assumptions” mean some parts of the network are considered full, where in reality there may be more capacity and less congestion than they think. We believe in embracing the technology and getting stuck into modernising the grid. Opening up the data is another important role for a DSO, although we appreciate this is non-trivial when their security responsibilities are considered. For a lay person there’s a lot to get your head round here. But for most NIEVO members the biggest take away may be that the regs to allows us to install larger PV arrays and domestic batteries should be here by the middle of next year. It’s clear that large organisations like NIE Networks face increasing challenges trying to keep up with technology. By their own admission they have under estimated consumer demand for EV’s. We welcome this consultation period and encourage them to make progressive decisions as we move towards a more electrified future. If you’d like to contribute to the discussion then you have until the 2nd October 2018 to respond. 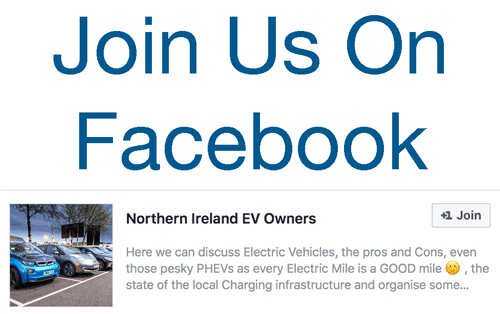 Be the first to comment on "Northern Ireland’s Changing Grid Prepares for More EVs, Battery Storage & Electrification of Heating"